Heavyweight Double Vinyl on Gatefold Sleeve. 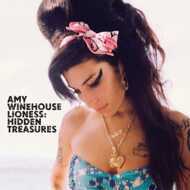 Lioness: Hidden Treasures the third album from Amy Winehouse is a 12 track collection of previously unreleased tracks, alternate versions of existing classics, as well as a couple of brand new Amy compositions. Following her tragic passing in July 2011, some of the producers and musicians who worked closely with Amy Winehouse, among them Mark Ronson and Salaam Remi, spent time listening over the many recordings that Amy had made, before, during, and after the release of Frank and Back To Black. It was said by all who worked with Amy that she never sang or played a song the same way twice. It quickly became apparent to Salaam and Mark that they had a collection of songs that deserved to be heard, a collection of songs that were a fitting treatment to Amy the artist and, as importantly, Amy the friend.